In view of the “Year of the Disabled Soldiers”, Red Horns Division of tthe Indian Army organised a successful Veterans Rally at Jagi Road on 13 October 2018 (Saturday). It was a sight to cherish, witnessing the convergence of past with the present, wherein the Army extended a warm welcome to its veterans and provided a platform to facilitate them. 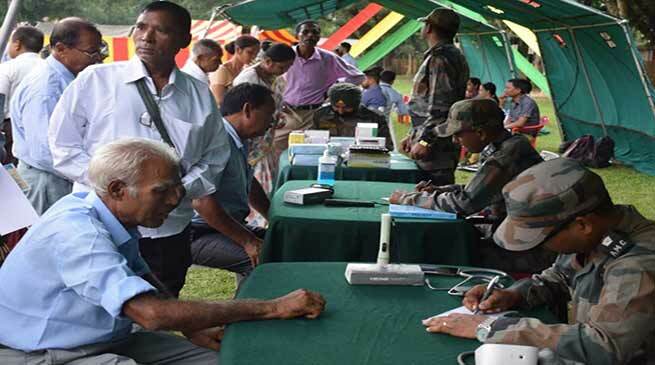 Two Disabled Soldiers, 308 Veterans along with five Veer Naris and seven dependents of Morigaon, Nagaon, Hojai, East and West Karbi Anglong were benefitted by the event. Active participation by Zila Sainik Board, Morigaon & Nagaon, Station Head Quarter Misa, SBI & ICICI banks made the programme a huge success amongst the veterans. Medical camp, suvigya cell, banking stall and placement information cell were established amongst many other stalls to facilitate Disabled Soldiers, Veterans, Veer Naris and Dependents. The event witnessed also witnesses display of Military Pipe Band.